Mother nature has been very tough on Japan this year. September brought two powerful typhoons and we here in Odawara were hit by one of them (Typhoon 15 or Roke as it is known outside of Japan). It was probably the strongest typhoon I've experienced here in Japan. It poured buckets of rain and brought a vicious wind to the Kanto region. In our apartment building, we (on the 3rd floor) were spared any damage (except for Taiga's vinyl pool being blown away), but every floor above us reported broken windows and/or water going into their rooms. 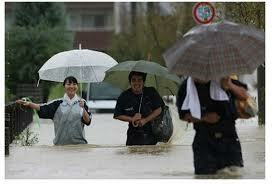 Odawara city also gave evacuation orders to those living near the rivers. They must do this if the river waters reach a certain level. In actuality, very few people listen to these notices and fortunately the rivers didn't flood. The strong winds also stopped the train lines in and out of the city. 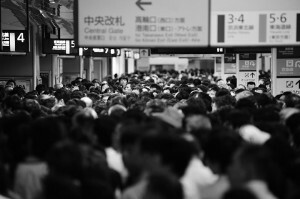 Many commuters were stranded for more than 5 hours. Those driving a normal 30-minute drive took more than 3 hours. This was also due to the signals being down as blackouts occured in some areas as well. In America, we don't have typhoons; we have hurricanes. So what's the difference? Not much. Both are severe tropical systems that have wind speeds greater than 74 mph. Unlike Japan, the U.S. uses names instead of numbers to name them. Before 1979, only female names were used because hurricanes were named after the girlfriends or wives of US Army Air Corp and Navy meteorologists. Male names were later added for gender equality.